It is well known that the liver represents a so called biochemical laboratory of the human body, where more complex processes take place. One of the many functions the liver performs is detoxification. Excessive intake of medicines, improper diet and certain bacterial and viral infections often leave severe consequences and pose a threat to the liver’s well functioning. The liver (hepar) acts like a blood factory in the body. It helps the organism to strengthen and stimulate digestion as well as to clean the blood and remove all the toxins and waste products found in it. According to this it is clear that a clean liver gives the body health, vitality, energy, fresh look and a good mood . Liver cleansing using black grapes starts with the following procedure: First, choose high quality raisins. Be aware that nowadays high quality raisins aren’t always available in the nearest market or store. When buying raisins, avoid choosing very light, yellowish raisins. Bright colored raisins come as a result of sulfur dioxide treatment or in the best case, due to inappropriate drying rules. Also don’t choose the “glowing” looking raisins . The chances are very high that they have also been chemically treated. Raisins with high quality are not shiny , wrinkled, not too soft nor too hard (similar to soft rubber). They must be preserved and not damaged. Good raisins have to be dark or brown coloured ( if it comes to brighter grape variety – then raisins have light brown color). There are also black raisins with a bluish shade, made by dehydrating darker vine types. It would be ideal if you can find raisins along with their small stems, which is one of the main indicators of naturally produced raisins. Once you select the best and chemical-free raisins, you can start preparing the following recipe which will help you cleanse your liver. 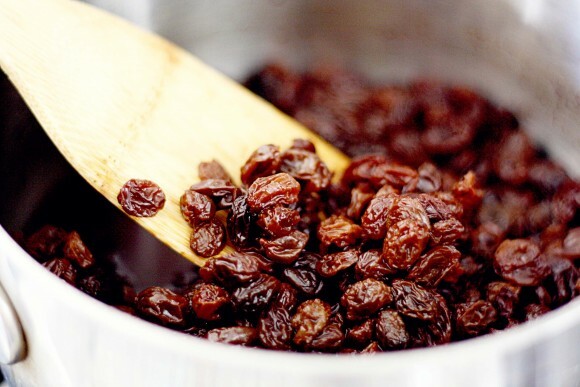 Soak half a cup of raisins in hot water and let it rest for 15 minutes, then wash .
Place the washed raisins in a cup and fill the cup to the brim with boiled water, cooled to room temperature. Let the raisins rest for 24 hours (until the next morning). The next morning, before having breakfast, drink the beverage and eat the raisins. Lie in bed for one and a half or two hours and put a hot compress (or even better, a hot-water bottle) on the right side of your stomach. Repeat this cleansing procedure once a week for one month (i.e. once a week during the month) and twice a year .